Steinway, Model O, 1909, SOLD! Not only is this piano a piece of history, it is a fabulous instrument! Built in the heyday of Steinway's long and storied history, it has been lovingly maintained. The beautiful satin ebony finish is just the beginning. A restoration of the action took place in 2005 using all Steinway parts. Paperwork is available including an appraisal for $27,000.00! (New Steinway Model O pianos list for over $70,000). In essence, this piano is not even 15 years old! The price on this piano is a true bargain. The value will not go down over time, if it is maintained properly. The hammers are only lightly used, and the sound is warm, and singing, not overly bright, or overly dark. It plays marvelously and sounds beautiful! 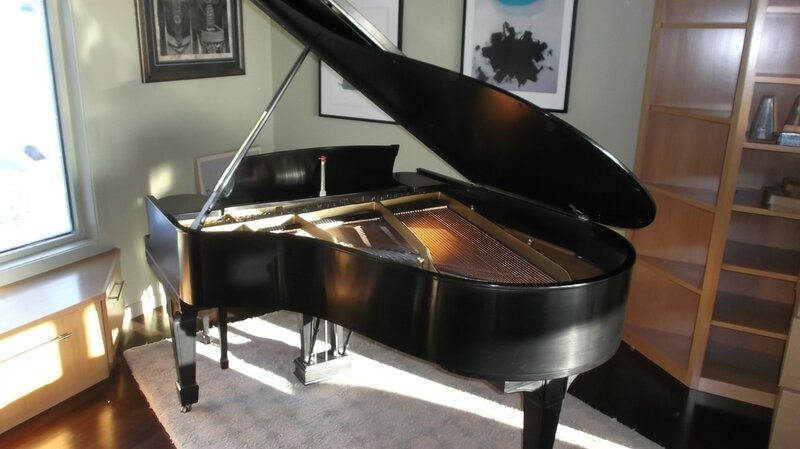 This rare Model O is a 5' 10-1/2" piano that would be perfect for many homes, but also more robust spaces. For the last couple of decades it has been kept at a steady temperature and humidity, and promises to remain stable for a long time to come. Currently maintained by an experienced Steinway Registered Piano Technician.